From the top stars of Hollywood to Chicago´s best-known celebrities like Michael Jordan and Oprah Winfrey, Bill Zwecker is the expert when it comes to knowing the scoop on the rich and famous. The Chicago Sun-Times columnist -- who is also the entertainment reporter and film critic for Fox Chicago News (WFLD-TV) -- previously was the entertainment reporter and film critic for WBBM-TV (CBS) in Chicago (2003-2009). Bill covers the globe finding out the latest news about celebrities. Bill earlier worked at Fox Chicago News (WFLD-TV) from 2000-2003 -- also as the station's entertainment reporter and film critic. From 1995-2005, Bill was the entertainment contributor and film critic for ´´The Eric & Kathy Show´´ on WTMX-FM radio. From 1993-2000, Bill was the entertainment reporter and film critic for WMAQ-TV (NBC) in Chicago. He was also a regular contributor to ´´The Joan Rivers Show,´´ 1990-1994. The Chicago native grew up in Oak Park and River Forest -- graduating from Oak Park-River Forest High School before heading to Princeton University where he received his bachelor´s degree with honors in American History and American Civilization. He also attended the University of Chicago Graduate School of Business. After working in politics (for former U.S. Sen. Charles Percy), banking and retailing, Bill turned to journalism fulltime in the early 1980s, following in the footsteps of his mother, Peg Zwecker, the nationally-syndicated, award-winning fashion editor and columnist for the Chicago Daily News and Sun-Times. Bill was associate editor and columnist for the Lerner Newspapers, 1987-92. Bill has been a frequent contributor to various national news and entertainment programs -- including Access Hollywood, Entertainment Tonight, Showbiz Tonight, Extra, Today Show, The CBS Nightly News, Biography on A&E and Larry King Live. Among numerous honors, Bill has twice been awarded the prestigious Peter Lisagor Award, Chicago journalism´s highest accolade. 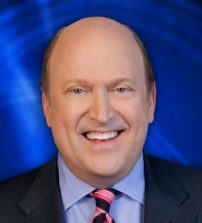 He has been nominated for three Emmy Awards for the Midwest/Chicago region for his work at both WBBM-TV and WFLD-TV. Bill was part of the WBBM-TV news team honored with an Associated Press award in 2004 for coverage of the E-2 nightclub disaster in February, 2003. Oak Park-River Forest High School inducted Bill into its Hall of Fame in 1995, presenting him with its top alumni honor, the ´´Tradition of Excellence´´ award. In 2000, Bill was named ´´Man of Vision´´ by the Midwest Eye Banks for his various civic and charitable contributions. The Isreal Film Festival presented Bill with it´s Lifetime Achievement Award in 2004, along with Larry King and Hollywood producer, Laura Ziskin. Bill Zwecker currently serves on the board of directors of Roosevelt University, He´s a board member of Off the Street Club, Chicago´s oldest organization serving children and teenagers on the city´s West Side; and the Advisory Board of the Midwest Eye-Banks. Past board memberships have included: Board of Trustees, Roosevelt University, Auxiliary Board, School of the Art Institute of Chicago, Chicago Academy for the Arts, Greater North Michigan Avenue Association, Auxiliary Board of Lincoln Park Zoo (founding member), Mental Health Association of Greater Chicago, Chicago Lung Association, Princeton Club of Chicago, Henrotin Hospital, Chicago Symphony Orchestra (Junior Governing Board), AIDS Foundation of Chicago, North Dearborn Association and the Headline Club of Chicago (Society of Professional Journalists). Bill lives in Chicago´s Streeterville neighborhood.